The purpose of our bioinformatics staff is mainly to solve problems such as microarray design and data analysis by developing an automated approach. Several tools were made for rapid chip design and analysis, in parallel specific algorithms were developed to enhance probes discrimination. a local BLAST database which allows us to customize our database with specific clinical sequences (archiving) and also shorten the searching time. a mini LIMS for archiving and managing microarray experiments. Edena is an overlaps-graph based de novo assembler dedicated to process the Illumina GA paired-end (short inserts) and mate-pairs (long inserts) dataset. 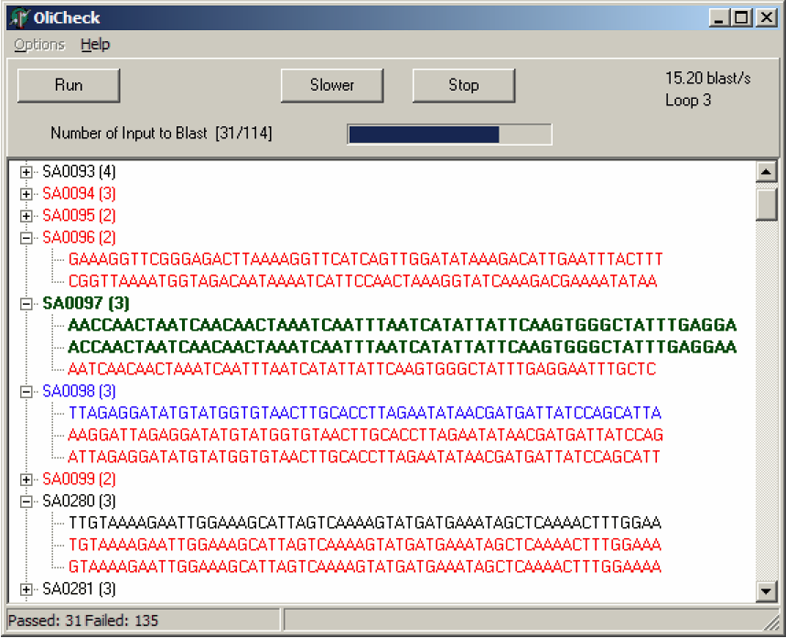 OliCheck is a program designed to test the validity of potential microarray probes by considering the possibility of cross-hybridization with non-target coding sequences. This analysis can be performed within a single genome or between several different strains/organisms. Software available - with demo input files - for Windows platforms. Charbonnier Y, Gettler B, Francois P, Bento M, Renzoni A, Vaudaux P, Schlegel W, Schrenzel J. [Click for Gallery] This software is dedicated to our high-throughput MLVA method (Multi-Locus VNTR Analysis, see Reference below) which was developed for the rapid and affordable genotyping of MSSA and MRSA. This method determines the number of dinucleotide repeats in several genes (currently 10 different targets within a single tube), and separates them using rapid capillary electrophoresis. This approach is coupled to this dedicated interface used for peak detection and data analysis (clustering) providing very high strain discrimination, applicable for outbreak analysis (Harbarth et al., Emerg Infect Dis. 2005 Jun;11(6):962-5.) or prolonged follow-up. Francois P, Huyghe A, Charbonnier Y, Bento M, Herzig S, Topolski I, Fleury B, Lew D, Vaudaux P, Harbarth S, van Leeuwen W, van Belkum A, Blanc DS, Pittet D, Schrenzel J.